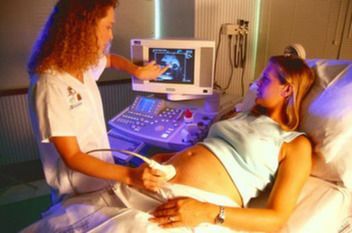 As with any aspect of medical care,knowing that a patient is or could be pregnant is important information.Pregnancy,for example,might explain certain symptoms or medical findings.When a pregnant patient is ill or injured,the physician will carefully select medications to avoid potential risks to the developing child.This is also true of x-rays. While the vast majority of medical x-rays do not pose a critical risk to a developing child,there may be a small likelihood of causing a serious illness or other complication.The actual risk depends on how far along the pregnancy is and on the type of x-ray.Ultrasound studies,for example,don't use x-rays and have never demonstrated any potential risk to pregnancy.X-ray studies of the head,arms,legs and chest do not usually expose the baby directly to x-rays and typically the technologist who takes the x-rays will implement special precautions to ensure that the baby of a pregnant patient is not directly exposed. Sometimes patients need examinations of the abdomen or pelvis while they are pregnant.When studies of the abdomen or pelvis are required,the physician may prefer to order a different type of exam for a pregnant patient oruce the number of x-rays from that which is normally acquired.Therefore,it is important that you inform your physician or the x-ray technologist about your reproductive status before the x-ray study is performed. Most standard x-ray examinations of the abdomen are not likely to pose a serious risk to the child.Some abdominal and pelvic studies such as CT deliver greater amounts of radiation to a developing pregnancy.Informing the radiologist that you are or might be pregnant is important so that your medical care can be planned with both you and your baby in mind.Remember,this is done to optimize medical care byucing any potential risk.See the CT During Pregnancy page for additional information.